Hi Everyone! My name is Casha. I am one of the admins for the Christian Networking Marketers Community and today I’m talking about being bold for Christ, not just in our everyday lives, but in our business too. Do you want to live and speak more boldly for Christ in your business? I know I do. Jesus was bold in everything He did… he hung out with the outcasts, he went against the status quo, and His teachings were radical then and now and He has called us to act in the same manner. Yet I see so much fear and uneasiness in how we approach others and how we run our business. I wonder why we so often hold back and why we stay silent? Are we ashamed of Him or what we’re doing? Are we afraid of offending someone? I can’t imagine Jesus ever being afraid of offending people by spreading good news and sharing the gift of salvation. The same can be said for our business and the gifts- our products and opportunities- we each have to bless and change someone else’s life with. 2nd Timothy says: “For God has not given us a spirit of fear and timidity, but of power, love, and self control. As entrepreneurs, we are pressed to always be growing, doing more, being better, bigger, faster. We’re overloaded with information and consumed by the next thing- the next rank, next sale, next opportunity so much so that we begin to lose sight of Him and begin to focus on our earthly gains. Our profits, our likes, and anything else battling for our attention and when we do, we miss Jesus. We get so busy trying to fill in the gaps and make up for our shortcomings that we end up in the dark. It’s when we fail to seek God first that we are no longer able to be bold, instead we are bound by our flesh. So how do we harness the power of Christ to be bold in our business? In order to be bold for Christ in our business, we must remain in Him because apart from Him we can do nothing. When you make God your boss, He becomes the driver of our business and when we consult Him just as we would a coach or advisor, our desires become His desires. We are all flawed and have shortcomings, but while we might be lacking Christ is not lacking in anything. In fact, it is when we are lacking that Christ and His power can truly be seen. It is when when we truly surrender to His power that we are able to be bold for Christ, allowing the spirit of Christ to shine through us- What we think, what we say, and what we do. It is when we have confidence in Christ we are able to have confidence in ourselves. Immediately Jesus made the disciples get into the boat and go on ahead of him to the other side, while he dismissed the crowd. After he had dismissed them, he went up on a mountainside by himself to pray. Later that night, he was there alone, and the boat was already a considerable distance from land, buffeted by the waves because the wind was against it. Shortly before dawn Jesus went out to them, walking on the lake. 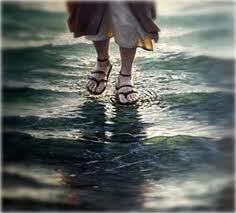 When the disciples saw him walking on the lake, they were terrified. “It’s a ghost,” they said, and cried out in fear. But Jesus immediately said to them: “Take courage! It is I. Don’t be afraid.” “Lord, if it’s you,” Peter replied, “tell me to come to you on the water.” “Come,” he said. I love this story because I see it reflected in our business. Working in an entrepreneurial world is kind of like the water in the storm that day- it’s dark and we;re unable to see far ahead, the wind is blowing, the water is rough and God is calling us to get out of the boat. Sure it’s easier and safer in the boat, but the beauty of this story is the work of Jesus that was able to be seen through Peter’s faith in stepping out just as the work God has planned for you and your business, as long as you get out of yours. I’d love to hear your thoughts on this concept in the comments or via FB messenger. What does being bold for Christ in your business look like for you? Are there places in you’re business that you’re keeping from God? How might you show up with your customers and your team if you embrace your weaknesses? What would happen in your business if you got out of the boat?